This super creamy and cheesy vegan mac and cheese recipe will take you straight back to childhood! Growing up, my mom was usually the one who cooked for us, preparing elaborate and wholesome meals from scratch, with plenty of vegetables. But every now and then, my dad would take over the kitchen. One of my absolute favorite lunches he’d make us was boxed Kraft macaroni & cheese, which I called “cheese soup” because he’d always add extra milk so there was twice as much cheese sauce. Although I haven’t eaten the Kraft version in years, I still love my mac and cheese with A TON of extra cheese sauce. Serve me a bowl of homemade macaroni drenched in so much creamy cheese sauce that you can’t even tell there’s pasta in the bowl, and you will never hear me complain! Update —> Also be sure to try this recipe for Cauliflower Mac And Cheese! The vegan macaroni and cheese recipes out there are definitely hit or miss… and the bad ones are really bad. I remember back when I first went vegan, trying a recipe that attempted to mimic the cheesy taste by using a combination of nutritional yeast and Dijon mustard. The recipe claimed to taste JUST LIKE REAL MAC AND CHEESE! Spoiler alert: it didn’t even come close. 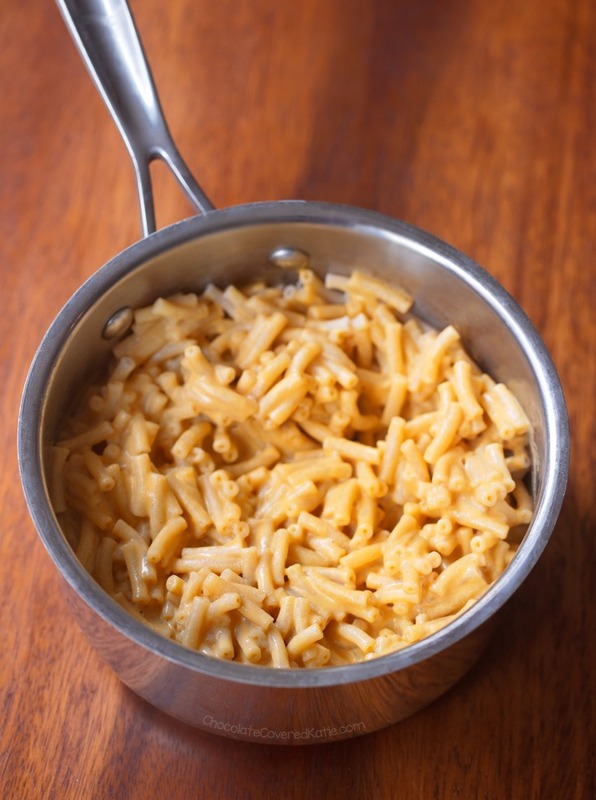 I’ve also tried some restaurant versions or packaged varieties (not naming names) so far away from tasting anything like mac and cheese that I honestly don’t know how they ever made it onto shelves. With this simple vegan mac and cheese recipe today, I’m not going to tell you it tastes exactly like Kraft or Velveeta, but it is absolutely delicious in its own right and completely satisfies even my strongest mac and cheese cravings. 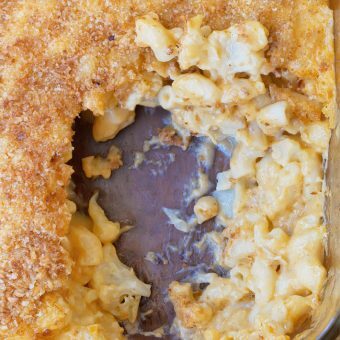 The recipe received a resounding stamp of approval from every non vegan who’s tried it, which is hugely important to note, because if someone who remembers what traditional mac and cheese tastes like says it’s good, you know it must be true! I’m not saying vegans have inferior taste buds (obbbbviously my taste buds are super awesome), but I do admit that sometimes we can get excited about a dish simply because a plant-based version is offered. I can think of quite a few examples of this from over the years, especially with things I’ve ordered at restaurants. You can also bulk up the mac and cheese by stirring steamed or roasted veggies in at the end. I especially love adding steamed broccoli. Or give the pasta a protein boost by adding crumbled tempeh or your favorite protein of choice. 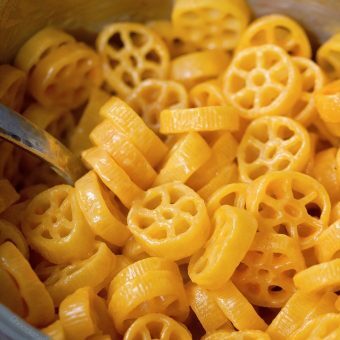 Pretty much any noodles will work here – I’m partial to tube noodles because they trap more cheese! For the photos, I really wanted the recognizable Kraft pasta shape but couldn’t find it anywhere, so I ended up buying boxed vegan mac and cheese and used my own sauce recipe instead of their packet. 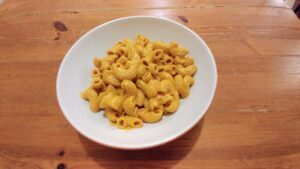 Unlike many other dairy free macaroni and cheese recipes, this one has no butternut squash or cauliflower, although I do have recipes for both of those elsewhere on the blog. To add thickness and creaminess without flour or heavy cream, I turned to cashews this time, which gives the sauce a rich and velvety texture. 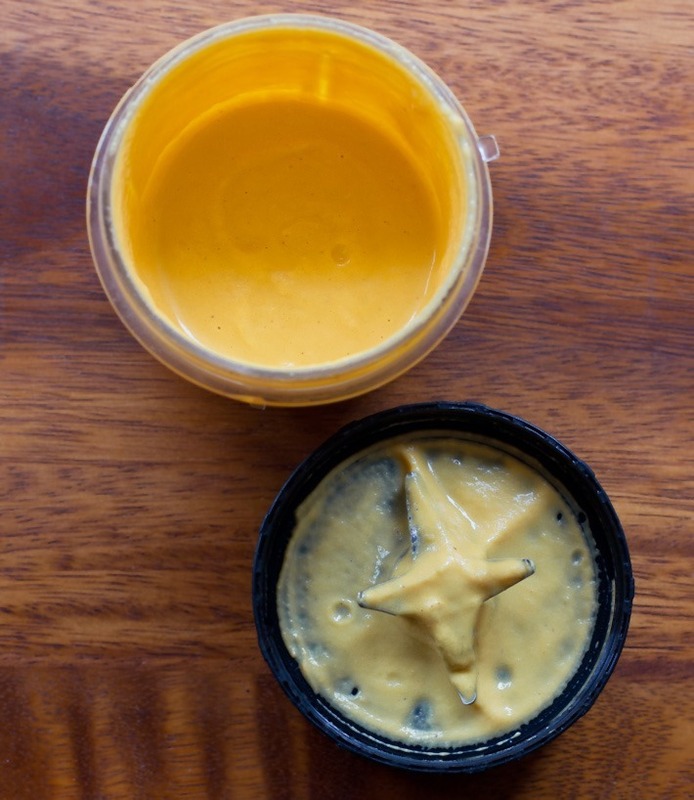 I’ve also linked a nut-free and soy-free Vegan Cheese Sauce. With mac and cheese, it’s good to have options. 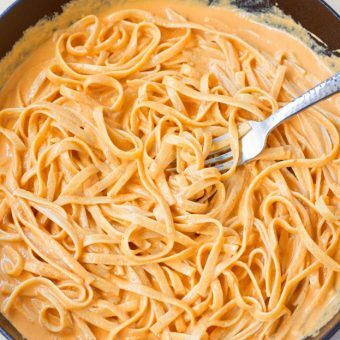 Finally, if you’re crazy like me and want to drown your pasta in a gallon of cheese sauce, feel free to make a double batch! Completely cover the nuts in a bowl with water. Let soak anywhere from 2-6 hours, or refrigerate and soak overnight. Drain fully. Combine all ingredients (including 1/2 cup water, but not including the optional cheese-style shreds), and blend in a blender or with an immersion blender until completely smooth. Transfer to a small pot and heat to your desired temperature, stirring optional cheese shreds in at the end. Taste, and add extra seasonings (onion, salt, nutmeg, pepper) if desired – I like to add another 1/2 tsp salt and a pinch more nutmeg. Serve over cooked pasta, rice, veggies, etc. This looks absolutely amazing! 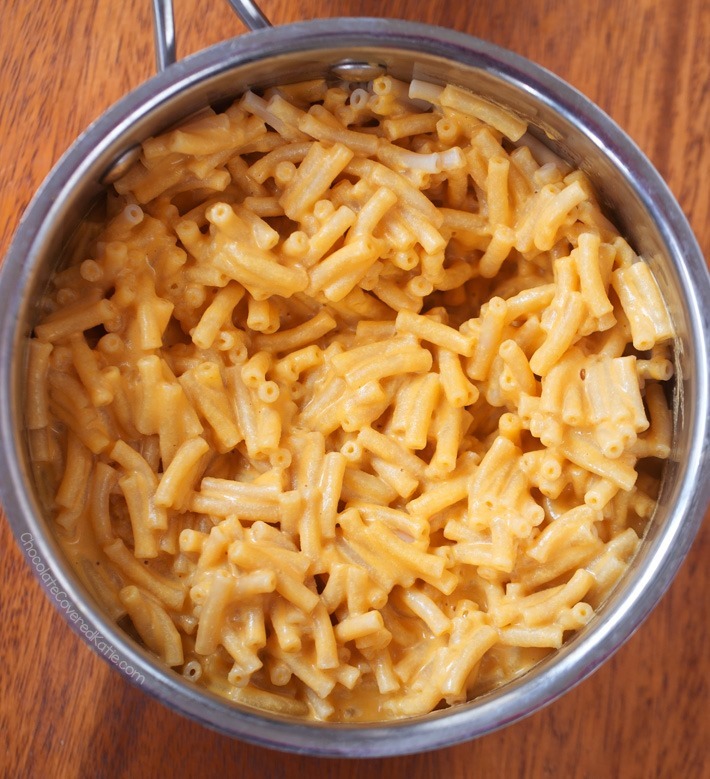 Mac and cheese is my favorite food (guilty as charged) – will have to try this recipe out! This looks so good! 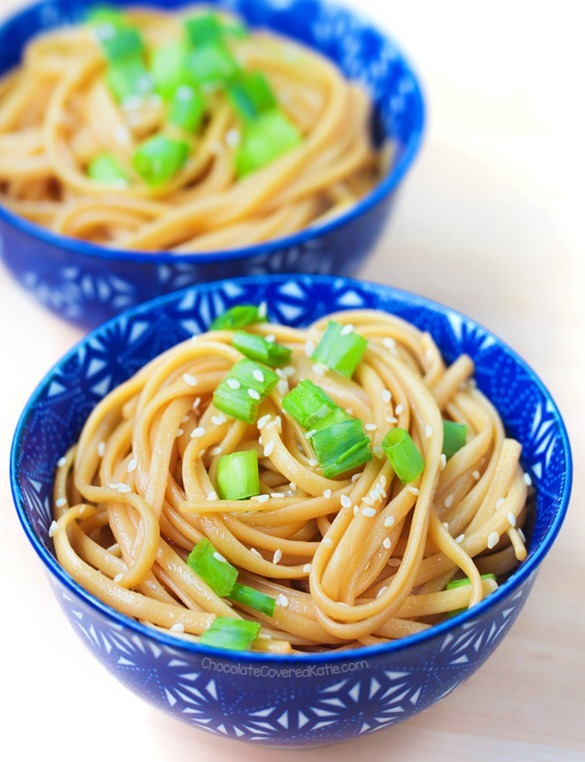 Totally making this with the kids for lunch today! did you make this yet? I’d love to hear other’s comments on it. This looks great. My daughter can’t have dairy & really misses Mac & cheese. We haven’t found a good cheeses style shred yet, & it was getting expensive to keep trying them. What brand do you or your other readers like? Thanks for all the great recipes! Hi Amy! Have you tried Miyoko’s? Or Chao? Or Follow Your Heart? I’m guessing you’ve tried Daiya, and I know that one is either something vegans love or hate! We like the almond shredded cheese from Trader Joe’s. They also sell an almond cheese brand at Nugget Markets. I think it’s the best tasting out of all of the cheeses….and we’ve tried a LOT. That’s because the almond cheese at Trader Joe’s still has Casein in it which is a dairy product. It may be lactose free but it is not 100% dairy-free. Amy, if your daughter is lactose intolerant and not actually allergic to dairy, she should be fine with eating aged cheeses like Sharp Cheddar. So Delicious shreds! The best I’ve found, melts well too. Amy, somewhat ironically the company “Amy’s” makes an INCREDIBLE vegan mac ‘n cheese! Also, Miyoko’s is AMAZING. All of their products are just incredible. I just tried their cream cheese and it is outstanding–their vegan butter is amazing too. They never use plan oil, either, so that is a huge plus to say the least. I’m really looking forward to trying their mozzarella as I’ve heard great things and this company has never failed to amaze me. Chao is extremely good and now there’s another company similar to them that makes all kinds of vegan cheese products and they fortify it with B12 which I find really cool. I know chao is plan oil free and I believe the new company I referred to is, as well (sorry I don’t remember the name but it’s at whole foods all the time). Then you have nutritional yeast which is just awesome (and so healthy! 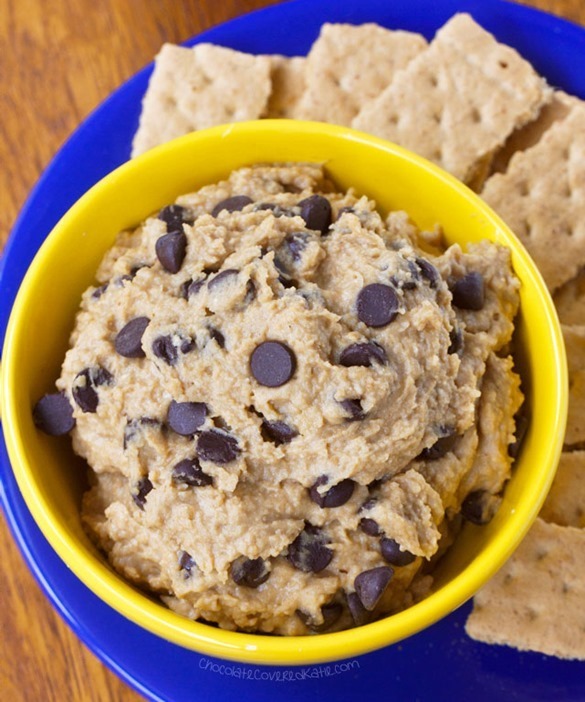 )… you can make so many homemade vegan cheese recipes with it and it is AMAZING on popcorn. The website the vegan 8 or something like that, has the best vegan garlic alfredo sauce recipe ever! I don’t know why their site now says the nutritional yeast is optional because it’s absolutely necessary and they also now say to use more lemon juice as an option but use the lower amount they say because you definitely don’t want it too lemon-y. Chao vegan cheese is, by far, the best vegan cheese we’ve found (get the creamy original flavor). It comes in a block of slices, but we just treat it like a block, and shred it, when needed. The closest thing I can compare it to is a cross between american cheese and provolone. Does it taste exactly like regular cheese? No, but it is absolutely as close as we’ve found, and my daughter actually LIKES it. No other one we’ve tried even tasted remotely good. Sometimes it’s hard to find, and it’s expensive (as are most non-dairy foods), but Whole Foods carries it, and recently Walmart started to sell it as well. Walmart has it for the cheapest I have found anywhere. I REAALLLY want to start a food blog! Any tips? This looks really good, just like the stuff I grew up with but much better! I can’t wait to try it! Do we add the nutritional yeast in the blender or when we are heating it up? I add mine in the blender! I saw on Instagram you used boxed mac and cheese noodles and your own sauce for the pictures. Which brand of vegan mac noodles did you buy? 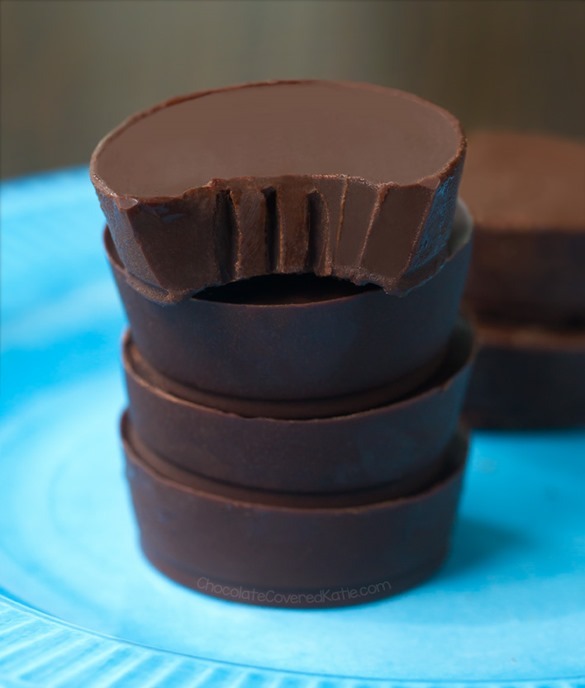 I’m dying to make them with the nostalgic noodle shape and I haven’t found any that are right yet. Thanks! The Creamette Ready Cut Spaghetti is like the Kraft noodles. This is delicious! I substituted low sodium veg broth for the water and added in a quarter of a red bell pepper and a sprinkle of smoked paprika. Will definitely be checking out more of your recipes! Thank you! I’m sorry but this did not taste like cheese at all. The only reason I even gave it 2 stars is it is creamy and rich. 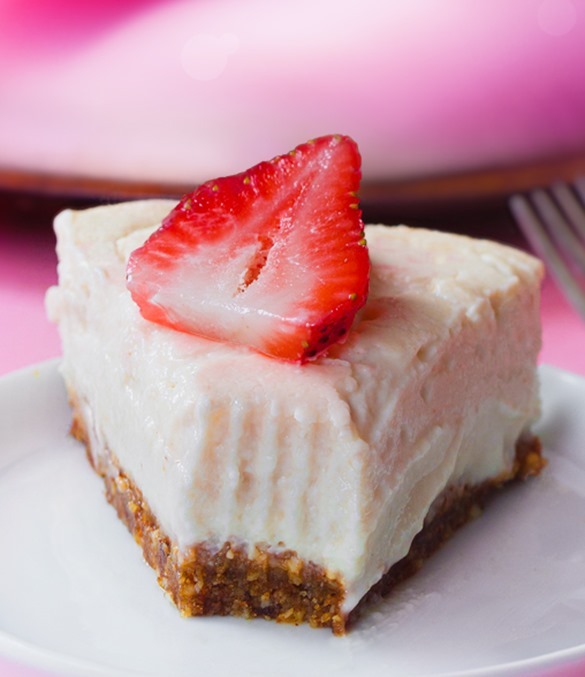 This is the first recipe from your site that I have ever not liked, and I’ve tried both sweet and savory. I have made vegan cheese recipes many times, with three different recipes as bases (depending on the ingredients in my pantry and what I’m making it for). I have done two different cashew cheese sauces and the one you referred to that uses potato, carrot, and mustard. All of them tasted better than this. I have never seen any cheese recipe using nutmeg before. Based on the taste of this recipe, I will never use it again. I had to add garlic powder, paprika, salt, and an ounce of goat cheese to make it taste decent (I’m not vegan, but use a lot of vegan recipes because I’m allergic to cow’s milk, and goat’s milk products get expensive very quickly). Not every recipe is for everyone, and that’s completely ok. I happen to really like this one (and I’m not vegan either) and have made it numerous times, but different people have different tastebuds and there’s no problem with that. However, I did want to mention that if you google mac and cheese recipes, many of them including Saveur, Food Network, and Martha Stewart do include a pinch of nutmeg. You don’t want too much, just a small pinch! it certainly doesn’t pass as cheese but I could understand it being called “cheesy” by vegan standards. That being said it’s incredibly delicious in its own right and I scraped every last bit to lick off the spatula! I’ll definitely make this again! As another non vegan, I feel the exact same way as you about this recipe! I’ve never been a fan on Mac n cheese but now I have stopped eating dairy I decided to give this version a try! WOW!! Its delicious!! I made double the cheese sauce and poured extra on my 2nd helping! Everyone loved it! Katie! 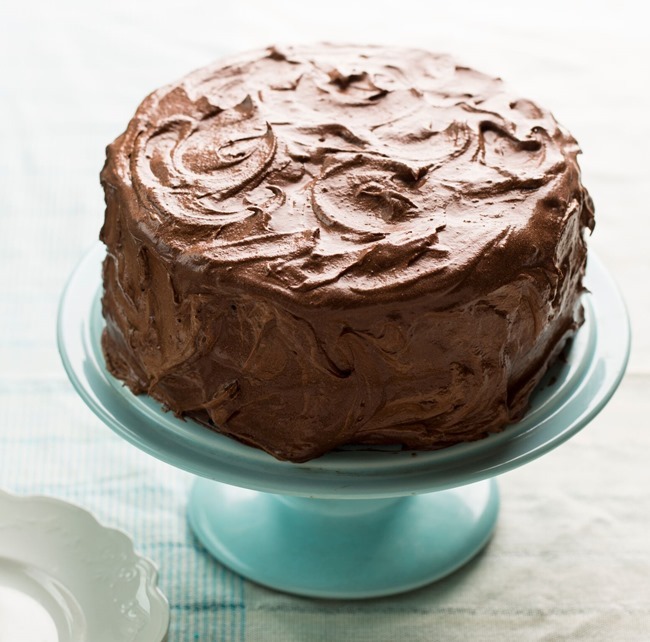 Your recipes are amazing, and this one is no exception. Seriously, the best vegan Mac and cheese I’ve ever made! I mixed in Daiya shredded cheeze and a little bit of nooch, and it was a great combo. I did double the recipe so my fiancé and I could have lots of leftovers. Thank you for creating and sharing such tasty recipes. You’re wonderful! OK, this looks AMAZEBALLS! Can’t wait to try it. I clicked on it after seeing it on Instagram yesterday and on a vegetarian and vegan Facebook group today, because it looked so like the Kraft macaroni and cheese which I adored. I normally never buy nutritional yeast, even though I love it, because here in Spain it’s really expensive, but you’ve inspired me to go get it! Plus it must have been the hardest subject to get a good photo of! Kudos for the great food photography, as usual! 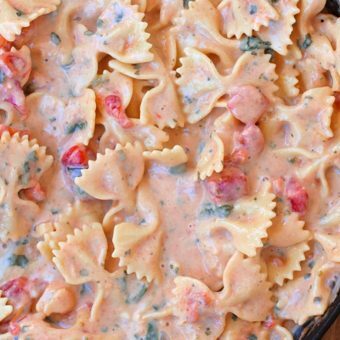 I’ve made this twice and I love the flavor but I can’t get it creamy! The first time I thought maybe soaking the cashews longer would do the trick although it didn’t make a difference the second time (I soaked for over 6 hours). Any ideas?? try blending the cashews and water first. then add the other ingredients to the blender. I agree with Dawn. If you don’t have a high speed blender, it’s harder to get the nuts really smooth and creamy without. Before I got a vitamix, someone said starting with a smaller amount of water also helps get them creamier. Omg this was soooo good! Really similar taste to Kraft mac n cheese and definitely one of the best vegan mac n cheeses I’ve ever had! Hi. You said a serving of of the cheese for the Mac and cheese is 1/3 of the recipe so got much is that for just the sauce?